// AND NOT ABOVE intMaxParts FROM RIGHT. Adjust the intMaxParts integer argument at the end of the script (the default 2 gives the @now line and its parent – 1 gives just the @now line – Infinity gives the whole path, other numbers give an ancestral path up to a maximum number of path segments long. If you want to display the current task in a different color, you can send text wrapped in HTML tags to TextBar. Wasn’t familiar with TextBar. Great little app. I need to delve into it a little more and this use case is a great one indeed! Thank you very much @complexpoint! how to change font for system and color for white? For hex strings yielding other colors, a web search will quickly lead to rgb -> hex converters, and lists of colors with their hexadecimal strings. can you give a mothed of apply bitbar app? after all, it is free to me. I’m not personally a user of BitBar, so I haven’t tested this, but glancing at their notes, it seems that all that is required is an (execute-enabled) bash script with a .sh extension, which returns a text. If you save the following as an .sh file, you should be able to fine-tune it to generate the text you want. This rough draft lists the first task which has a @now tag (any ancestral path delimited with arrows up to a maximum segment length). To generate a different text, you can adjust the itemPath expression that is bound to the variable name strQuery, near the top of the script. thank you for your reply so quickly. the textbar app is very good app,but it is not support to retina. have a good day (night? ),and thanks a lot. You did well to get that working so quickly. 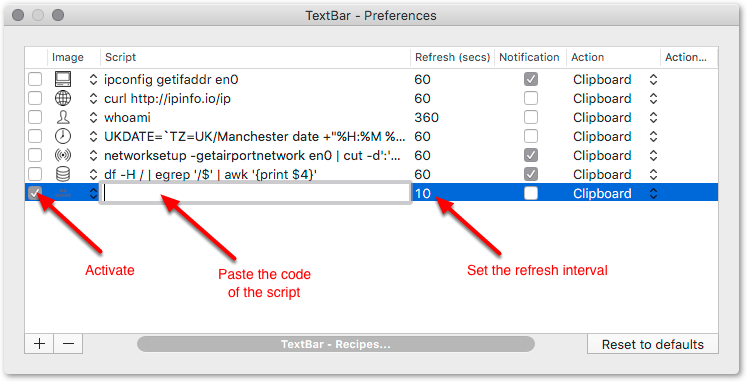 Textbar may be worth experimenting with too - you can use HTML for simple formatting. This is very cool! But I can’t get it to work for some reason. The script seems to produce the right result when run in terminal, but all I see in Textbar is “.” where the task should be. Any ideas? Thanks! @dgg I’m experiencing the same thing. Any ideas @complexpoint ? Perhaps this isn’t compatible with the latest version of Taskpaper? Very cool idea though.